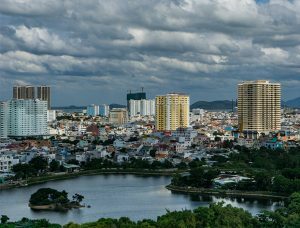 The first fully-integrated petrochemical complex in Vietnam has moved one step closer to fruition after a syndicate of lenders agreed to provide US$3.2bn in funding. The borrower is Siam Cement Group (SCG), the largest building material company in Thailand and in Southeast Asia. It is also Thailand’s second-largest company. Six lenders are involved in the package: Bangkok Bank, Export-Import Bank of Thailand (Thailand Exim), Krungthai Bank, Mizuho Bank, Siam Commercial Bank and SMBC. The loan has a tenor of 14 years, with SMBC acting as the financial advisor. Long Son Petrochemicals plant will be built in Vietnam’s Vunt Tau province, about 100km from Ho Chi Minh City. Construction is due to start in the third quarter of 2018, with the plant expected to produce 2.3 million tonnes of olefin – an unsaturated hydrocarbon used in wallpaper, carpeting, ropes and vehicle interiors – each year. The project requires total investment of US$5.4bn and is described by SCG’s president, Roongrote Rangsiyopash, as the company’s “flagship investment”. He adds: “This venture will increase competitive advantages of SCG’s chemicals business in Southeast Asia. Furthermore, the project is equipped with world-class advanced technologies which allow for high flexibility to utilise raw materials resulting in increased competitive advantage. The project also leverages digital technologies to create innovations for better products, services and solutions for customers.” The project has been in the works for years and SCG became the sole owner in May when it acquired Vietnam National Oil and Gas Group (PetroVietnam)’s stake in Long Son Petrochemical. Initially it was licensed in 2008 with an estimated required investment of US$3.7bn, which has grown significantly over the past decade. Given the importance of SCG and its vast array of subsidiaries to the Thai economy, the involvement of Thailand Exim is no surprise. It comes two months after the agency announced plans to open a representative office in Vietnam, with a view to expanding Thai exports to its Asean counterpart. “Vietnam is certainly one of the promising markets in the Cambodia, Laos, Myanmar and Vietnam (CLMV) region for Thai entrepreneurs,” said Thai Exim president Pisit Serewiwattana on a recent visit to Hanoi. The post Syndicate funds landmark Vietnamese petrochemical complex appeared first on Global Trade Review (GTR).